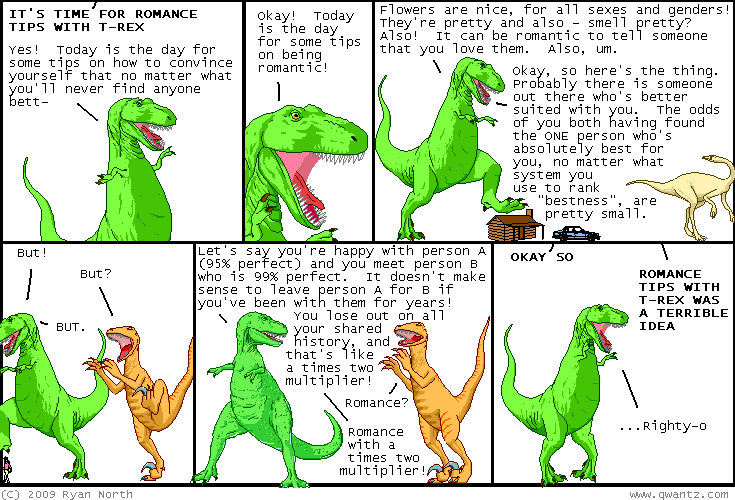 Dinosaur Comics - October 21st, 2009 - awesome fun times! October 21st, 2009: This is the last day of past-Ryan updates. Tomorrow, present Ryan takes over again! My friend Darryl wrote a great little iPhone/iPod game called "Card Control", which has full version of all these card games in one snazzy app. It's only 99 cents, which is like 5 bucks cheaper than what everyone else is selling these games for. I helped Darryl beta test it a little and told him that I'd totally link to it when it came out, but that was like a week ago when I wrote these words, and now when you're reading them it's ANOTHER full week later! If Darryl has emailed me in the meantime saying "Oh, hey, no biggie, I understand if you couldn't link to my new game, s'cool" then he's going to feel QUITE THE FOOL. Anyway if you're looking for a card game for your little computer boxes, Card Control is a good one! You can buy it from the App Store.